Yes, we now have a new Print Shop available as part of The Genetti Family Genealogy Project. During the past four months I have had several requests for copies of the Genetti Family Tree. The original artwork for the tree was commissioned by Maria Genetti of Castelfondo, Italy. Since only a few family members in the United States have a direct reproduction of this large and detail work of art, it has proven difficult to acquire a copy. I am now happy to announce that prints of the original tree are now available through this website! With Maria’s consent, I have digitally copied the image and formatted it for reproduction. To allow for easy ordering, reasonable pricing and direct shipping, I’ve partnered with Redbubble. This is a reputable commercial online printer who will handle all production, framing and shipping through its simple-to-use online store. To order, just go to Shop on The Genetti Family Genealogy Project website and scroll down to the image of the tree, click the link and you will be taken to our portfolio on RedBubble. Or just click here! 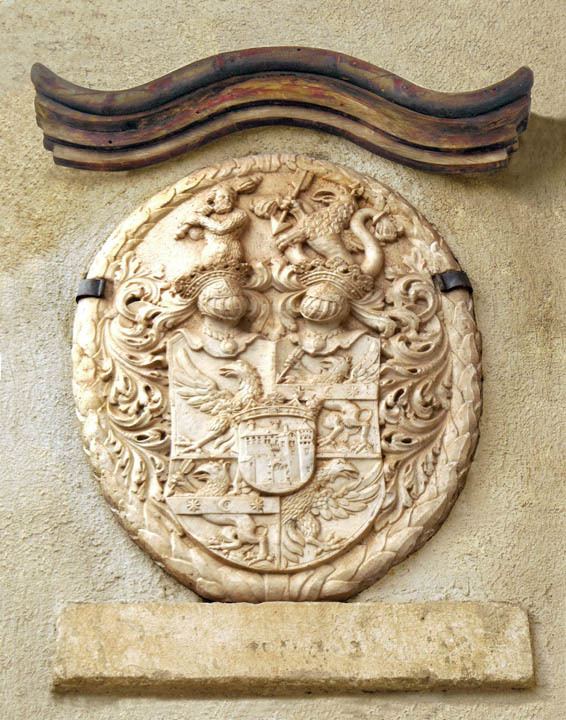 The Genetti Family Coat-of-Arms in Castelfondo, Italy. I have also made available as part of the portfolio two additional prints: The Genetti Coat-of-Arms and the fresco from the Genetti homestead. Both of these images are original photographs (created by me!) and formatted for a variety of sizes. Prints can be purchased framed or unframed, in several finishes, as posters and as cards. Due to the detail of the Family Tree I highly recommend only purchasing this image as: an Art Print in the Large and Extra Large sizes; a Photographic print in the Large size; or a Poster in the Medium or Large sizes. 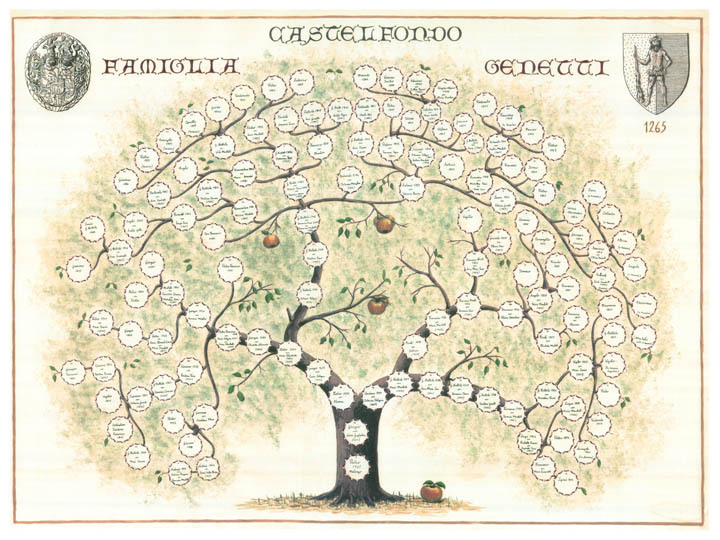 With Christmas right around the corner, I’m sure a print of The Genetti Family Tree would be the perfect gift for someone in your family. Disclosure: All products for sale on this website are provided and shipped by third party companies. I am an affiliate for these companies and use affiliate links from Amazon, Cafe Press and RedBubble. My compensation is a small percentage of the sales made through these links. Proceeds from sales helps to support the cost of this website and continuing genealogy research. 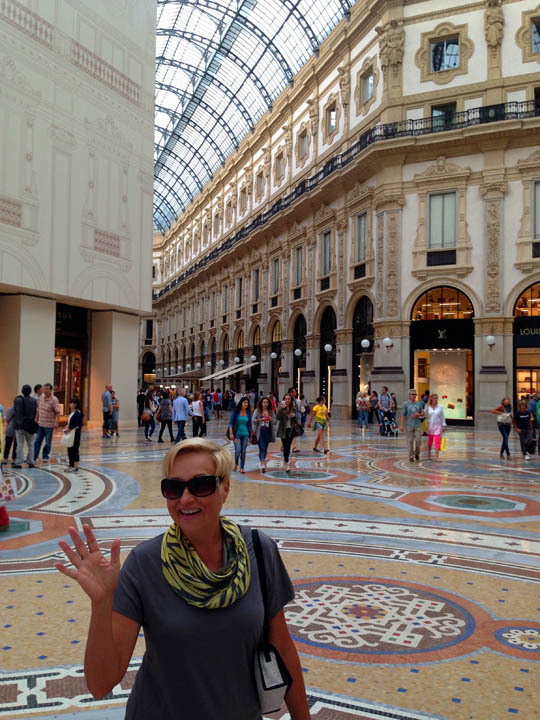 Although I’ve been home for ten days, I thought it fitting to close my Italian blog posts with how I began … in Milan. We embarked on our journey at the beginning of September with three days in the fashion capital of Italy. 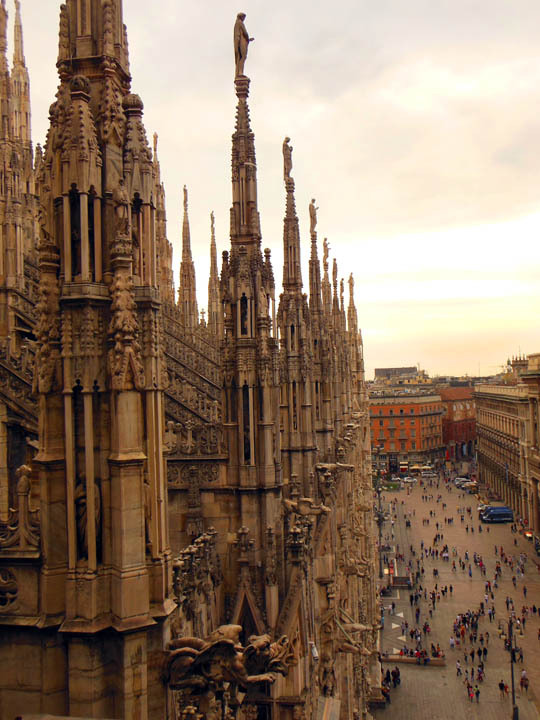 Although a metropolitan city, Milan is still walkable with many sites to enjoy. With an eight-hour time difference to contend with, our first days were spent adjusting and trying to get enough sleep! But in three days we managed to tour the magnificent Duomo di Milano, several other churches, Leonardo da Vinci’s Last Supper, Galleria Vittorio Emanuele II and Castello Sforzesco. Then is was off to Bolzano! At the end of our Italian trip, we boarded our last train from Verona, arriving back in Milan. With only an afternoon left, we opted to view a retrospect of Chagall’s paintings at the Palazzo Reale, have a final stroll around the Piazza and conclude with a light dinner and our favorite bottle of wine. Ahhh … the entire journey was a memorable adventure! 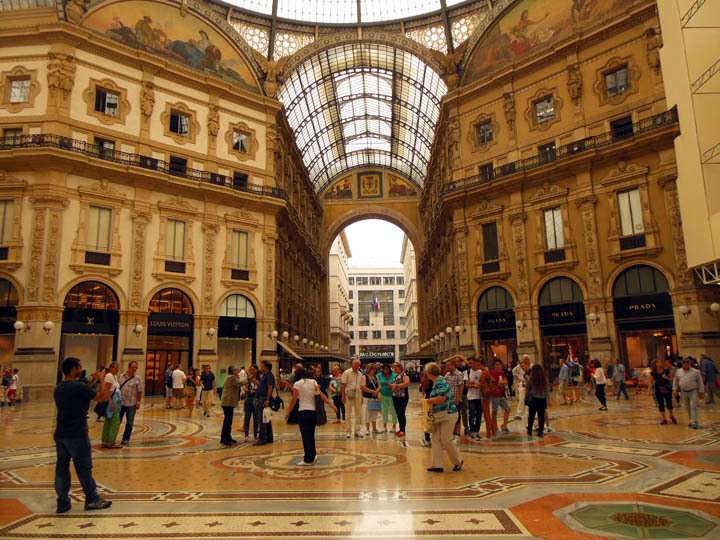 Galleria Vittorio Emanuelle II is one of oldest enclosed shopping malls in the world. Look closely between the Louis Vuitton store on the left and the Prada store on the right. Yes, that is a McDonald’s! 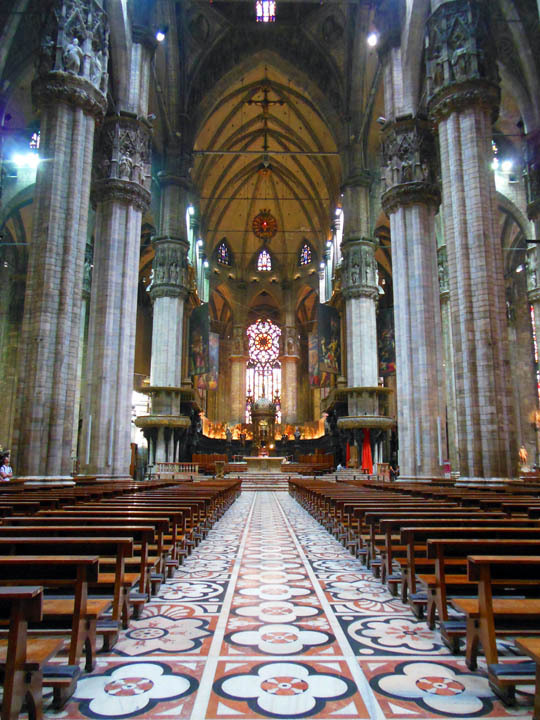 The Duomo di Milano is incredible inside and out. 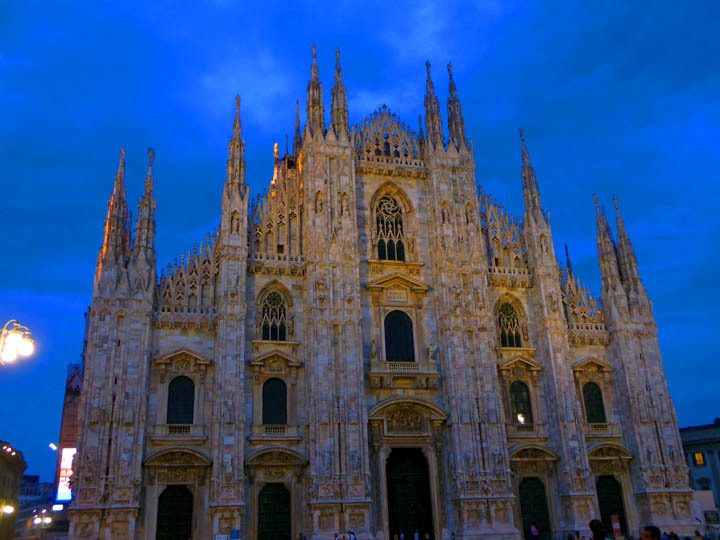 It is one of the largest churches in Europe and took almost 500 years to complete. The floor is composed of three different colors of marble and each square is pieced together as a mosaic. 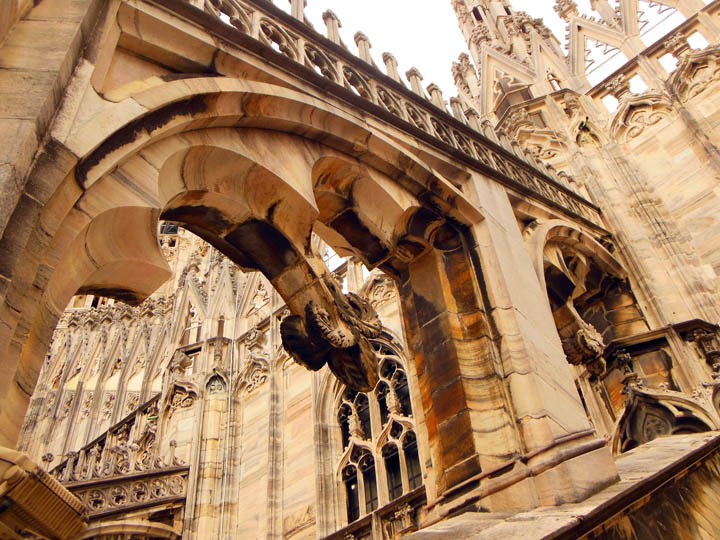 We booked a roof-top tour of the Duomo. This is the view looking down at the Piazza. From the Duomo roof-top you can see so much more! The entire outside is covered in carvings and statues. Plus many little secrets are hidden within obscure corners. So glad we took the time to do this! This is a copy of Da Vinci’s Last Supper (or L’Utima Cena in Italian). Only 30 people at a time are allowed into the specially conditioned room to view the masterpiece. It was awe-inspiring standing before the Renaissance fresco which takes up an entire wall. Absolutely no photos are allowed! To get tickets, you must book online several weeks ahead of your visit. Ciao a tutti da Milano! It has been fun. Hope you enjoyed my photos and posts. Until next time … Arrivederci e buona fortuna! It’s hard to believe that just a week ago I was exploring the streets of Verona. Home of the Montagues and Capulets (remember your high school lit class?). Verona was entrancing! The architecture, churches and meandering streets transported me back to an age of Gothic grandeur, with a Roman arena towering over city center. 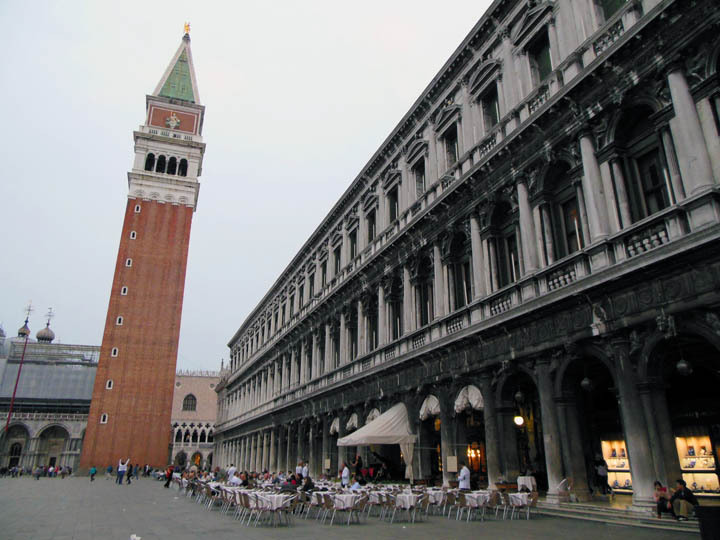 Such a gem of a city … doth I say, as beautiful a lady as Venice? 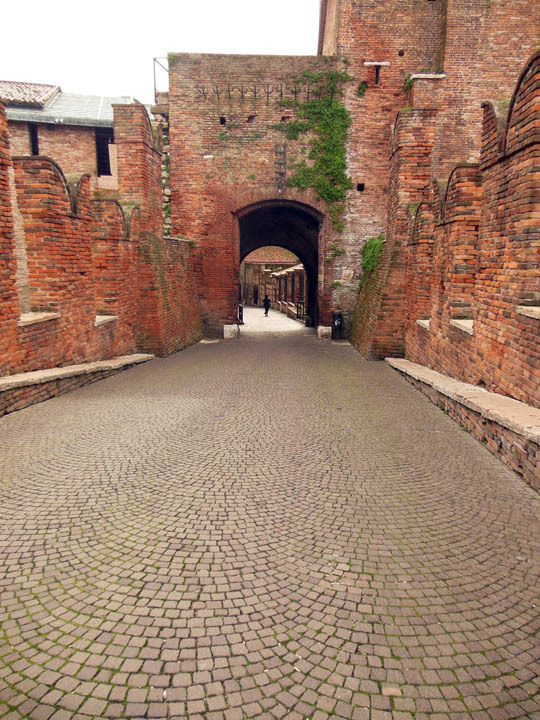 The streets of fair Verona with the Roman arena on the right. 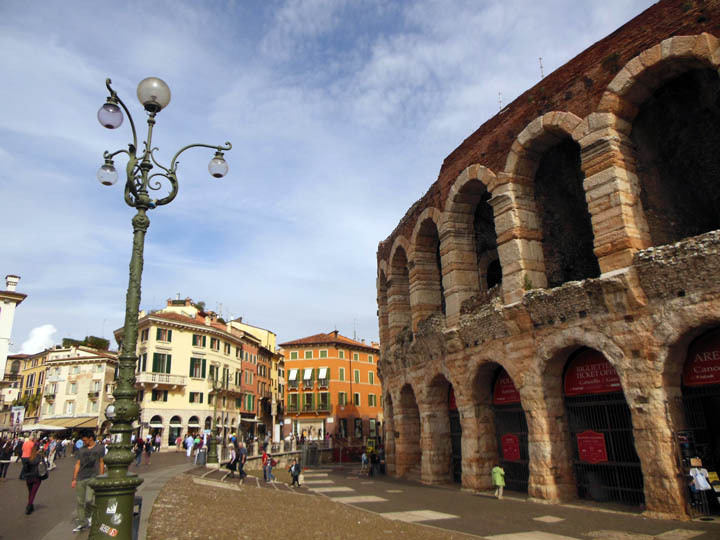 The Verona Arena was built in AD 30 by the Romans. It looks like a smaller version of the Colosseum. The interior has been updated with stadium seating and is still in use today for rock concerts and expansive opera productions. Renaissance splendor! 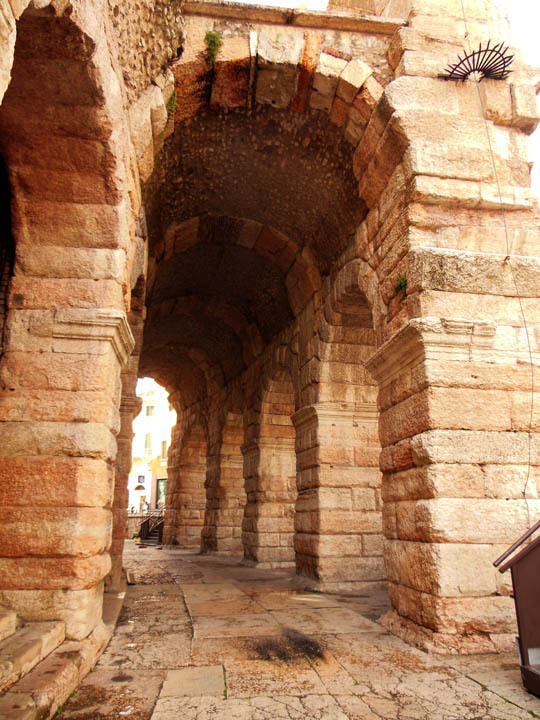 The architecture of Verona began with the Romans in the 1st century BCE and spans many historical periods and styles. 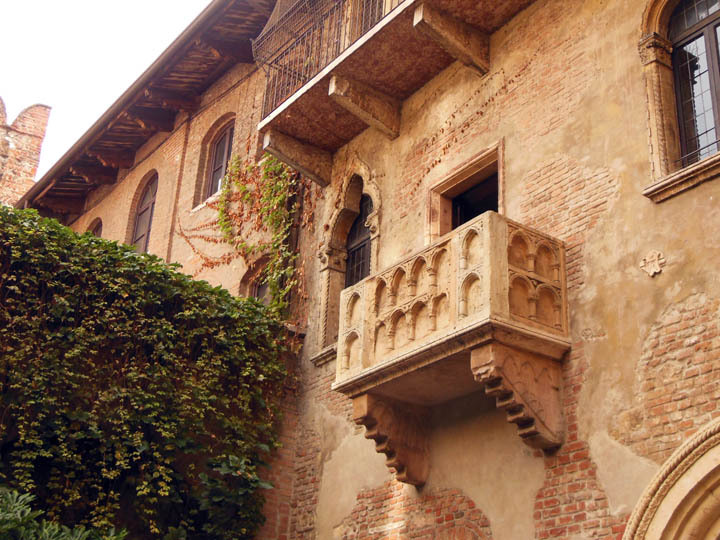 Juliet’s house – Casa di Guilietta – and her balcony are one of the main attractions of Verona. Sant’ Anastasia is an exquisite Gothic church built between 1280-1400. Frescos cover the entire interior. 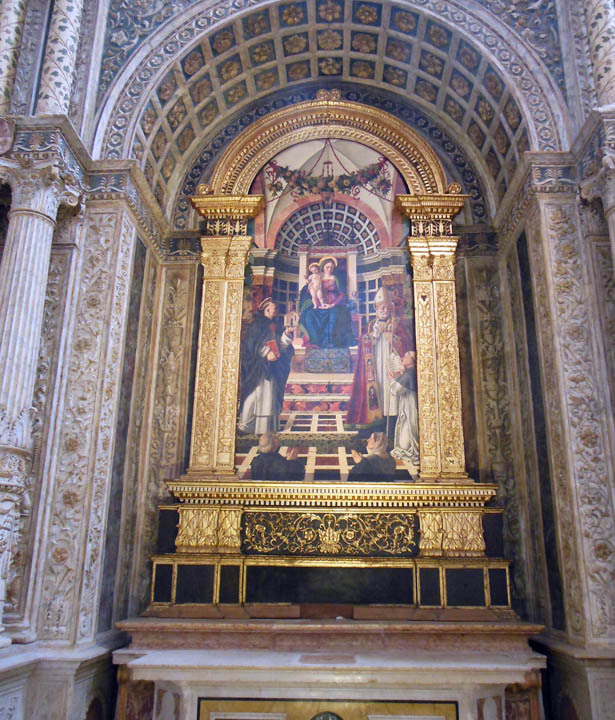 The church recently underwent an extensive restoration and the artwork absolutely sings with color! This was my favorite church from our entire trip. The Ponte Pietra (Italian for Stone Bridge) is a Roman bridge completed in 100 BC that spans the Adige River. It is massive and a truly impressive piece of architecture. My handsome husband, Michael, standing on the Ponte Pietra. 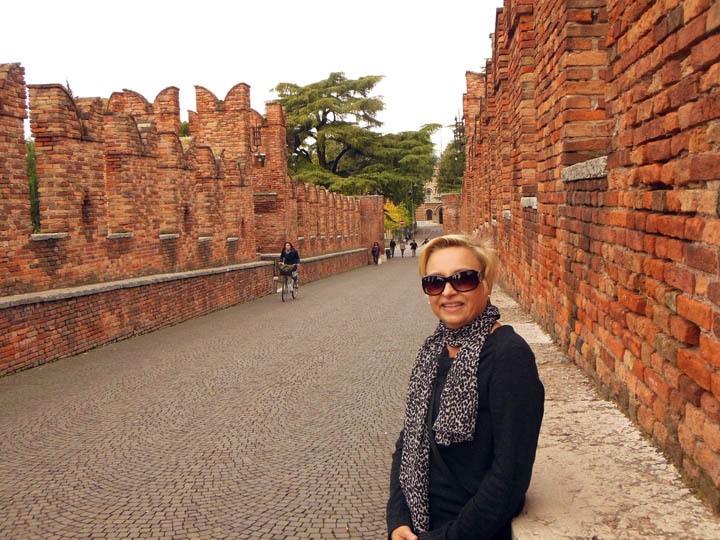 Me on the Ponte Pietra in Verona – only one day left before we leave lovely Italy. I am finally back home after our six-week adventure through Northern Italy. During that time I met wonderful Italian cousins, visited the birthplace of my ancestors, lived as an Italian in the charming city of Bolzano, hiked in the Alps, visited many historical sights and churches, and ate my fill of tradition Tyrolean cuisine. Yes, it was a memorable trip – one that I will never forget. 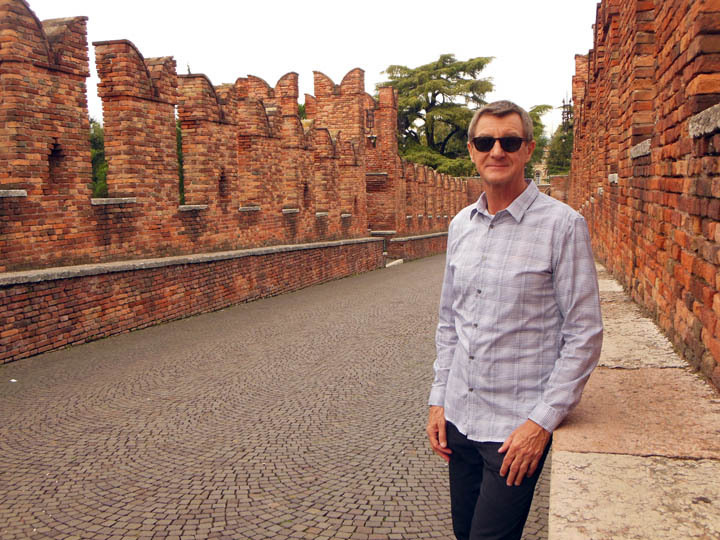 Our last week was spent in fair Verona, the setting for Shakespeare’s Romeo and Juliet. And we concluded the trip where we began with a final dinner at the Milan Park Hyatt, toasting a bottle of our favorite wine (a vintage from Lombardy that we cannot purchase in the USA). More photos to come in future posts of these two beautiful cities! 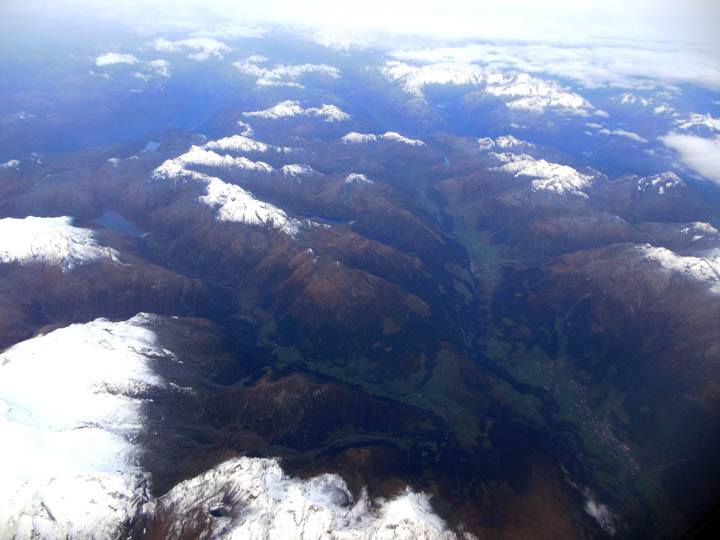 Leaving Italy – view of the Italian Alps from the air as we fly towards France. Then there was the VERY long trip home. In our final 48 hours we rode in a train, three taxis, three planes and a car. With lay-overs in both Heathrow and Dallas, the total trip from Milan to Santa Fe took 25 hours! I was one tired traveler by the time we arrived home at midnight on Thursday. I’m almost recovered from my jet lag and will soon post more fascinating info about the Genetti clan and our Italian adventure. Stay tune! I would be especially grateful if each of you reading this post helped spread the word about the Genetti Family website and blog. Email a sibling or cousin today and tell them about this unique genealogy resource. Information for the Genetti Family Genealogy Project can also be found on FaceBook at: www.facebook.com/genettifamilygenealogy. Just a few more photos for your enjoyment. 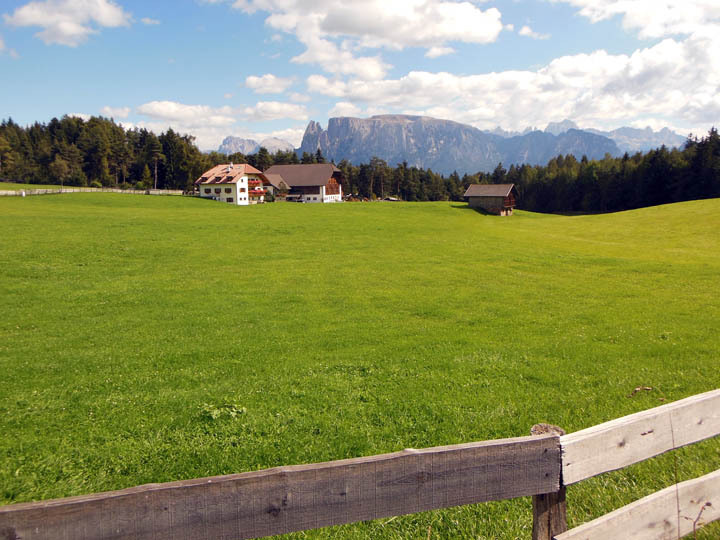 Countryside above Bolzano with the Dolomite peaks in the background. 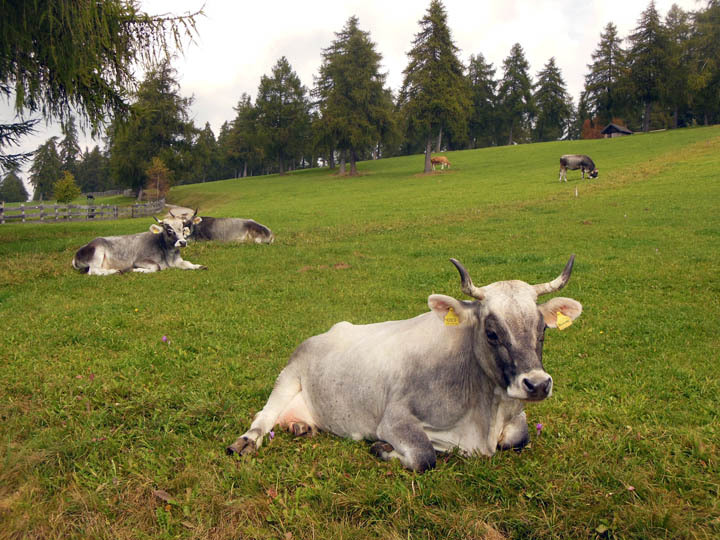 While hiking in San Genesio high above Bolzano, you pass many alpine pastures with well-fed cows! 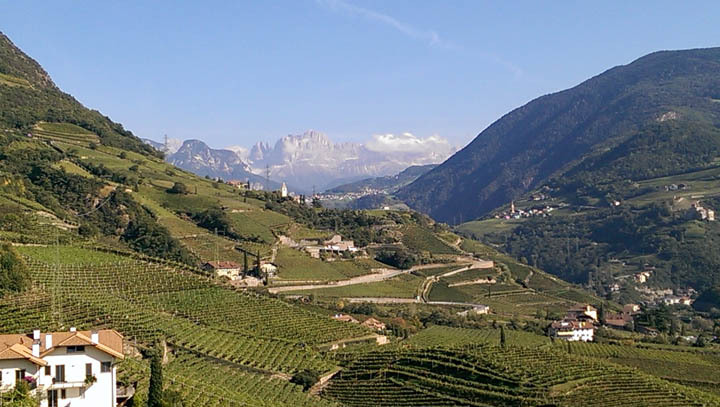 View of the Dolomites and vineyards from San Magdalena. 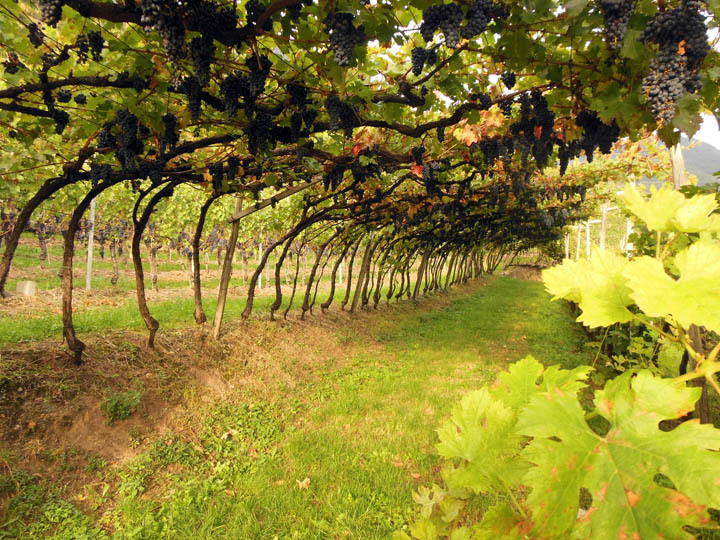 The Santa Magdalena vineyard produces an excellent regional wine. 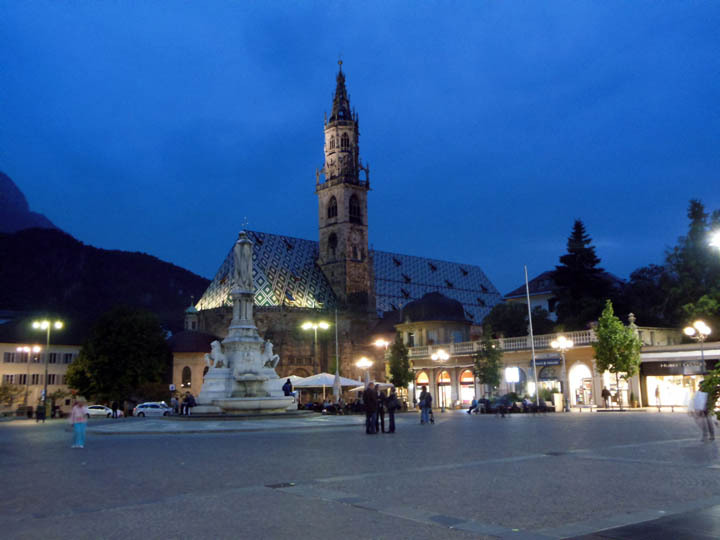 Evening at Piazza Walther, city center of Bolzano, Italy. The Duomo is in the background. 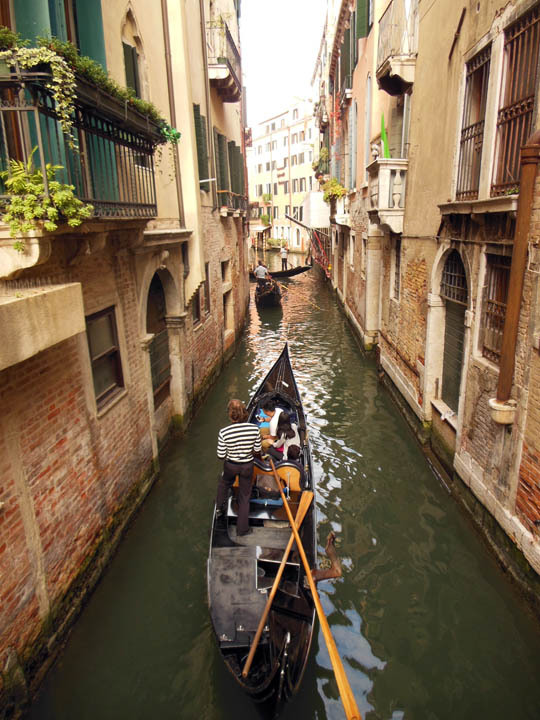 Last week held another Italian adventure … Venice! About 3 hours by train from our apartment in Bolzano, we decided a mini-trip to glorious Venice was a must. Off we went for three days to see the sights and sounds of this elegantly decaying lady of northern Italy. And she did not disappoint. With thousands of tourists from all over the world streaming into Venice every day (including George Clooney and his new bride!) it’s a sensory overload compared to quiet, laid-back Bolzano. After getting over the initial crush of bodies on our first water taxi ride up the Grand Canal (I don’t like crowds and usually avoid them as much as possible) and locating the little boutique hotel where we were staying, Venice became a joy to explore. With map in hand, we navigated the tangled streets opening into wide piazzas. Around every corner were surprises and what we used to call “a Kodak moment”. Piazza San Marco (Saint Mark’s Square) was exactly how it looks in photos: expansive views, regal architecture and filled with people from all over the world. And yes, the bell tower in this photo is leaning precariously! 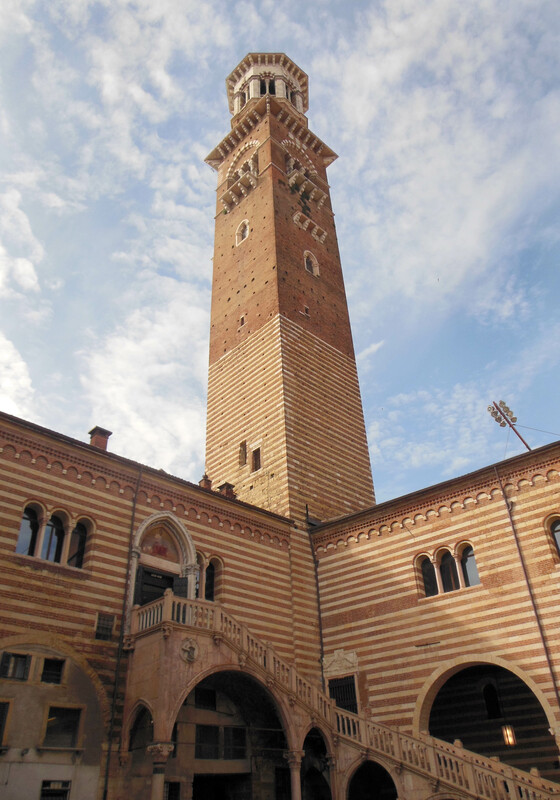 This is a relatively new structure since the original “campanile” collapsed in 1902. We wandered through cobbled streets connected by little bridges crisscrossing willy-nilly while gondolieri in their striped shirts navigated the slender black boats in the canal below. Tiny specialty shops operated out of every available niche, while richly decorated designer stores made for interesting window shopping. Day 2 brought rain – a blessing in disguise as the crowds were less and it was much easier to see the sights. We had come prepared with umbrella and rain jackets. 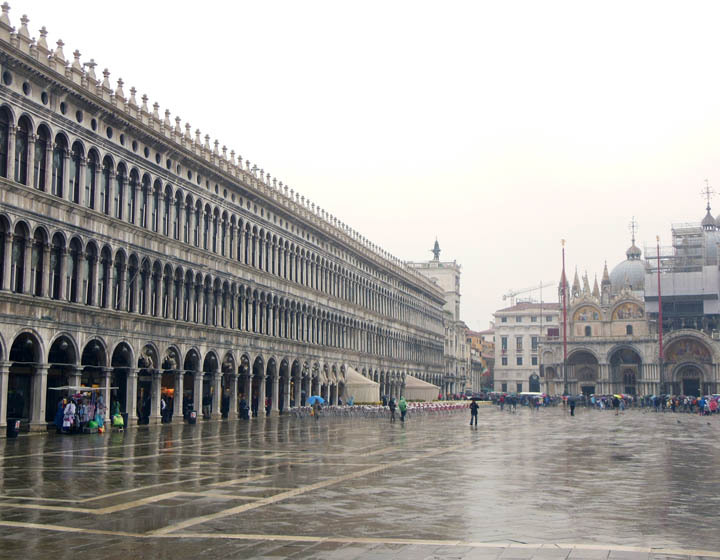 I was singing in the rain that day as Venice was a memorizing, watery reflection of beauty. Michael and I whiled the morning hours away at the Peggy Guggenheim Museum, enjoying the modern masters that graced the lovely villa, once home to the heiress. 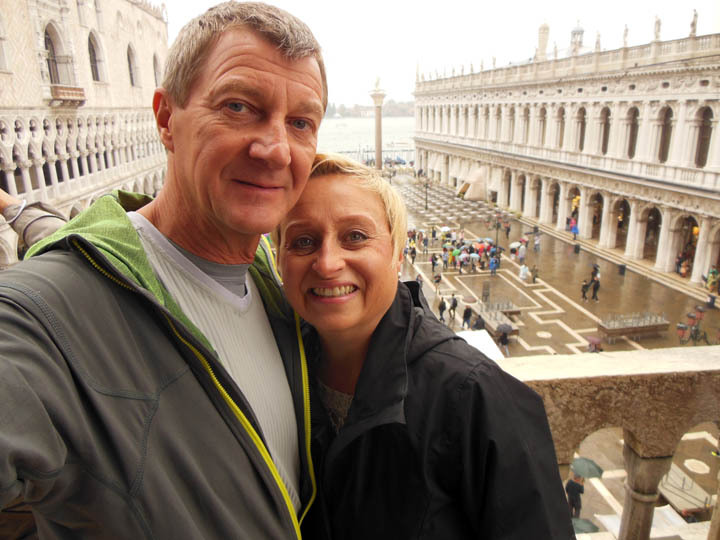 After a light “pranzo” (lunch) we climbed the steep stairs to the top of San Marco Basilica. There we could see the complete interior of the massive Gothic structure from the balcony, walk through a thousand years of church history in the museum and climb out onto the roof to gaze at the square below. It was a very good day! Day 3 was a boat ride to the Venetian island of Murano. Quaint and cozy, this is the place where famous Murano glass has been manufactured for centuries. I left with many photos and memories, and just a taste of historic Venice. As we boarded our train for the trip back to our adopted home in Bolzano, I wondered if my ancestors ever made it to this island wonderland. Before the automobile, it probably took two days of travel by horse and carriage down river valleys and over mountain passes to reach the shore. Then a ferry ride to finally arrive at the city. I don’t know if they ever travelled east of their mountain home and gazed upon beautiful Venice. But I do know that they were courageous people who made a difficult decision to travel west, to a strange country. Between the 1870’s through the 1920’s, many Tyroleans made their way over the Alps to the south of France where they boarded a crowded ship bound for a new country. They may not have seen the treasures of Venice, but they did create their own fortunes in America. A week ago the Genetti “cugini” or cousins got together for an impromptu Saturday morning gathering. Several of our Italian cousins live in or near Bolzano, Italy – the city where I have been staying for the past month. We gathered at Laura’s husband’s shop located close to city center. Carlo loves to travel the world and for the past ten years has built a business selling ethnic jewelry and accessories which he purchases directly from artisans he meets on his travels. We are hoping that Carlo will visit us one day in Santa Fe and add Native American jewelry to his inventory. 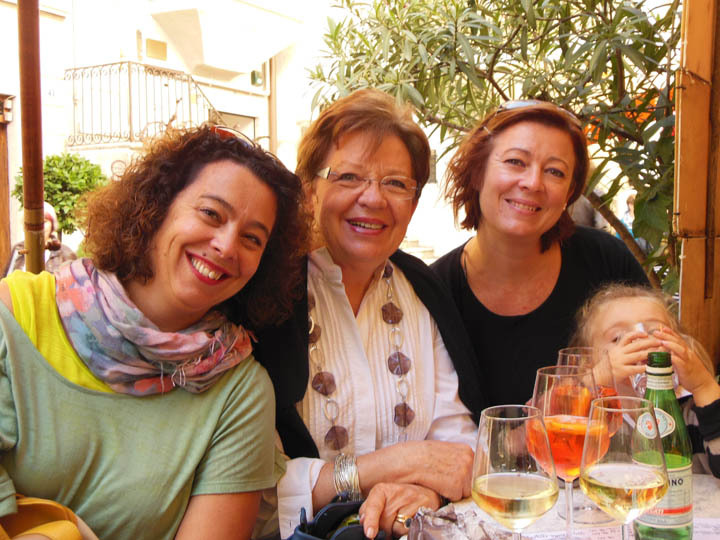 Cousin Lidia Genetti with her two daughters Giovanna and Laura. 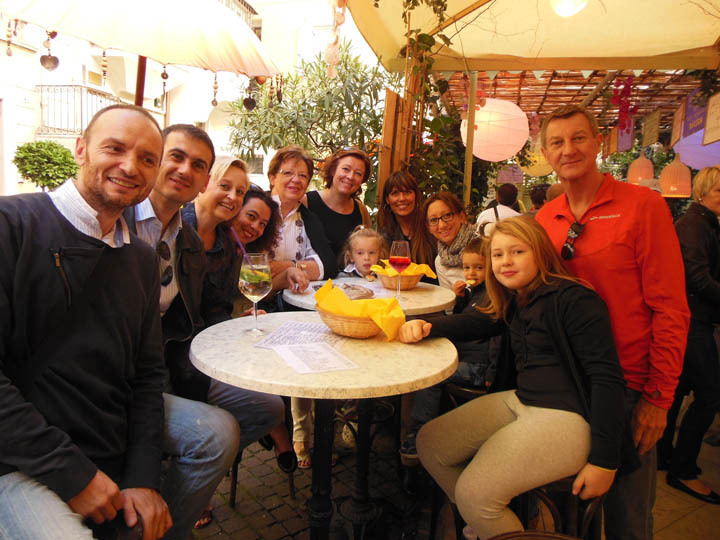 Today there were a few more cousins joining us that I had not met on our previous outing, Laura’s sister Giovanna and Stephania’s brother Enrico. Along with the children and a friend of Laura’s (who turned out to be a TV journalist for a local station) we had 13 people meandering through the market crowds of Piazza Erbe. We came to stop at our favorite outdoor café, commandeered two tables and enjoyed drinks in the autumn sunshine. After a few hours of chatting, it was time to say our goodbyes and go on our separate ways. It was another lovely day in Bolzano with my Genetti cugini!